Yes, that time of the year has arrived, and it’s not at all too early for us to start sharing pot hole stories and listing our “worst of” pot holes of Providence. Most of Gano Street between Medway Street and Waterman Ave.
PROVIDENCE – Mayor David N. Cicilline today announced an aggressive program to systematically repair potholes in the capital city. The City has intensified its efforts by adding Parks Department vehicles to the fleet of Department of Public Works (DPW) trucks so that there will be, effective today, eight fulltime crews filling potholes throughout the city. The trucks are equipped with a new high performance patch material that has proven effective in repairing potholes, even in wet conditions. DPW staff conducted a citywide review of Providence’s 370 miles of roadway to determine the extent of the problem and will continue filling potholes on main arteries before working their way to secondary roads. Crews are using a proprietary high performance cold mix patch to repair the roads, a material that includes a special blend of anti-stripping additives and adhesion agents that are known to last 3.5 times longer than the conventional pothole patching material. Anyone with concerns about specific potholes on city streets should contact the Office of Neighborhood Services at 421-2489 and the City will dispatch a crew to repair the pothole within two business days. OMG. 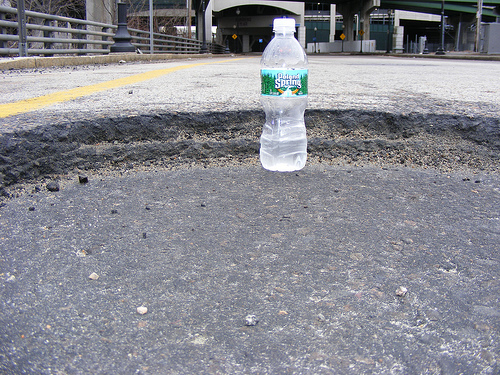 I was gonna do some Potholeblogging this weekend, except I was gonna use a coffee milk as the point of reference. I was too lazy to go out and do it though. I would nominate Dean Street, except I think Dean Street is beyond pot hole, it is just gone, the whole street, gone. I think though, shock of shocks, some of them were filled yesterday! Amazing, I know! There’s still at least 3 inches of ice on the sidewalks outside the Atwells Mini Mart though. I nominate School St between Valley and Harris. It’s only one block, but you might as well be off-roading. There’s very little road surface left. I was going to nominate Dean Street as well. Even with the half-assed filling that they tried yesterday it is a treacherous piece of roadway. Also: Knight Street between Atwells and Broadway. There are some potholes there that you can bottom out your car in. 1- Tobey St. off of Broadway, the area getting onto Route 10 is downright dangerous. 2- Bainbridge between Westminster and Broad streets is terrible, there is one giant pothole that goes all the way across, there isn’t enough room for a car to pass through and avoid it. 3- Syacmore street right off Westminster is terrible, another situation where the pothole goes right cacross the entire road. The West Side is generally a big mess, the potholes are insane! One of the reason the potholes are so terrible, especially on the west side, is because the roads were never built correctly in the first place. Knight Street is a great example of how no amount of cold patch is going to fix that problem because the road was built WRONG. Jen – It certainly seems that way to me. Do you know for a fact that they were built wrong? No, not for a fact, but common sense tells me that water isn’t supposed to puddle on the street, that it is supposed to run off so that it doesn’t erode the road bed by just sitting in a gigantic puddle. I’m not sure that they were built wrong necessarily, but they were definitely paved wrong once the cobblestone came up in the 1920s-1950s. Perhaps we should allow sponsored potholes. Aren’t drivers too busy texting to see ads on the pavement? Maybe if more people sued, they city would finally do something. The potholes really are just unsane!